This was a very odd game — with a very dramatic finish. Early in Sunday’s Super Bowl, the New York Giants — aided by New England quarterback Tom Brady’s safety — looked unstoppable. The Giants had a huge advantage in both momentum and yards, but despite all this, they only scored nine points. Then Tom Brady and the Patriots became, well, Tom Brady and the Patriots. The Giants kicked a couple field goals, Brady roughed his shoulder up on the turf, and then — with about four minutes left in the game — the Patriots had one of the most heartbreaking sequences in franchise history: Brady and Wes Welker, who know a thing about throwing and catching, failed to connect on a throw up the seam, where Welker was essentially uncovered. Then New York quarterback Eli Manning hit Mario Manningham on a nearly impossible throw down the sideline for a huge 38-yard gain. By now, you know the rest. The Giants scored the game-winning touchdown after Patriots coach Bill Belichick smartly let them, and Brady failed to make good on his desperation drive with a late Hail Mary. Giants win, 21-17. Let’s compare those two game-changing pass plays: the failed pass from Brady to Welker and the play of the game, Manning’s fantastic throw to Manningham down the sideline. The pass to Welker is one of the Patriots’ old favorites, and indeed is one of the first pass plays most high school teams install: The hitch/seam combination. The outside receiver (in this case, Deion Branch) runs five yards downfield and simply turns around. The inside receiver, Welker, runs up the “seam.” The quarterback typically looks to throw the ball to the outside receiver, but if the defense tries to take that away, the seam should be open. Further, the Patriots ran the seam routes to both sides, so Brady could simply throw away from the safety’s rotation. On this play, the Giants seemed confused as they rotated their coverages toward the right side, to Rob Gronkowski, and Welker was wide open up the seam. The Patriots actually scored on a similar concept earlier in the game, when Brady hit Aaron Hernandez crossing the middle in man coverage. 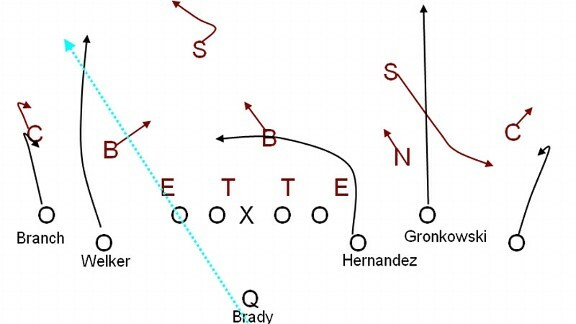 And even more dramatically, this exact play provided the meat for Brady and Welker’s best moment of the season, their 99-yard connection in Week 1 against the Dolphins. On the exact same hitch/seam combination, Brady hit a streaking Welker, who scored a dramatic touchdown and set the stage for his record-setting, 122-catch season. But things were not so sweet Sunday. On a play that could have sealed the game for the Patriots, the pass was incomplete. Brady tried to throw it away from the safety’s rotation, and arguably threw it too far away from him. Welker, who typically takes the seam further up the sideline, may (or may not) have kept it more inside than he usually does, given that he was so wide open he was simply uncovered. In either case, Welker twisted awkwardly to catch the ball over his opposite shoulder, but it hit him in the hands — and then he didn’t have it. (It appears that in the course of twisting around, Welker’s helmet came up and his chin strap was actually covering his mouth. That’s hardly an excuse, but seeing Welker not catch a ball like that is so bizarre, one looks for any reason why.) Both players would later agonize over the play. On the other side was Manning’s brilliant thread-the-needle pass to Manningham. Just previously, the two had barely missed on a similar fade throw to the opposite sideline. (Manningham caught it while stepping out of bounds.) But get used to this one: We’re going to see it a lot, for a long time. The entire game, the Patriots had played a form of Cover 2, with two safeties deep to take away the big plays. Belichick did not want the Giants to burn them with deep passes to Hakeem Nicks, Victor Cruz, or Manningham, and for most of the game they succeeded. The other elements of Belichick’s game plan were to move Vince Wilfork out to line up over the guard and tackle, to take away the off-tackle run game that the Giants favored (as with two safeties deep, the Patriots were a man short against the run the entire game), and to double-team the electric Cruz. This opened things up for Nicks, who had more than 100 yards receiving on 10 catches, and, ultimately, for Manningham, on the biggest play of the game. On the play, Manning and the Giants were really trying to go to the other side and to get the ball to either Nicks or Cruz. They called another classic, old standby pass play, “smash.” “Smash” involves an inside receiver, Cruz, running a route to the corner off the deep safety, while the outside receiver runs an underneath hitch or pivot route to pull the intermediate defenders up. Indeed, this play is extremely close to the hitch/seam play the Patriots converted on, and teams often install them as two sides of the same coin: Hitch/seam defeats three-deep coverages, while “smash” defeats two-deep ones. But the Patriots rotated their coverage over to Cruz and Nicks’ side, taking away where Manning wanted to go with the ball. But on the backside, Manningham defeated defensive back Sterling Moore off the line, and, fatefully, safety Patrick Chung came up slightly in following Manning’s eyes to the right, and was therefore out of position for the big pass to the left. Of course, let’s not get carried away: It was an extremely small window, and “out of position” is very much an after-the-fact statement. 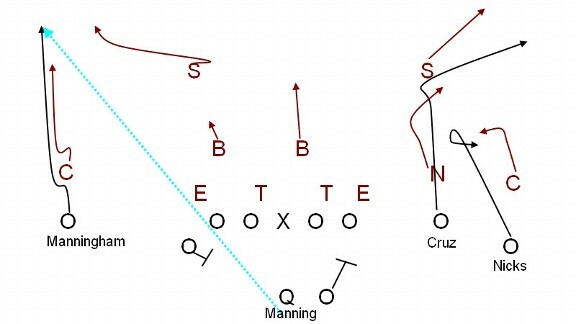 The credit for the play has to be given to Manning and Manningham: Manning for looking the safety off and throwing an incomparably beautiful and accurate pass into a vanishingly small spot, and Manningham for mustering every physical and mental tool he had to catch the ball and keep both feet in bounds. Just an amazing play. And in a game that seemed a triumph of incrementalism — of small, plodding steps toward the inexorable end — it was fitting that two big plays, Janus-like in execution and outcome, made the difference. Souper Bowl I: At Least You Won Something, New England!